Recently I saw the movie Inside Out, which features 11-year-old Riley (and her family) as they move across the country. Her personified emotions, Joy, Sadness, Fear, Disgust, and Anger navigate Riley through her days, but everything goes awry soon after the move–leaving Riley irritable and wishing to return to a time when life seemed to make sense. For many reasons, it is a wonderful film–entertaining, clever, and more moving than I even anticipated. Weaved in among all the other positive qualities, I also found it strangely freeing. Feelings and emotions are tricky things. It can be hard to show them at times, hard to know if it’s safe, if it’s wise, if it’s acceptable to be vulnerable enough with people to show them how we’re really feeling. At its core, one of the most important messages of Inside Out is that feelings are okay. Big feelings even, the startling kind that make us take a step back and try to figure out where they’re even coming from. Riley moved across the country, and I moved a few mere miles, but having feelings about moving is not bad or something to be ashamed of. Moving is a change, and changes can make us feel happy or scared or excited or mad or any combination of any or all of those, plus about a bazillion other emotions–but we don’t need to be afraid of them. Keeping feelings in indefinitely, trying to pretend they don’t exist, helps no one. Admittedly, I probably have a few more feelings than the average person, but I’m beginning to be more okay with that. It’s part of how I interpret and process the world around me. Granted, there are different ways of expressing feelings–some good and healthy, and others are destructive and unhelpful. Learning to express our emotions, in the right ways and in the right spaces and to the right people, is incredibly important. Inside Out was a poignant reminder of the necessity of acknowledging our feelings and working through them, instead of ignoring or running away from them. It’s not easy, simple work, because emotions are complex and shifty things–but it is good and needed work. Maybe Inside Out will free others to feel their feelings too. p.s. 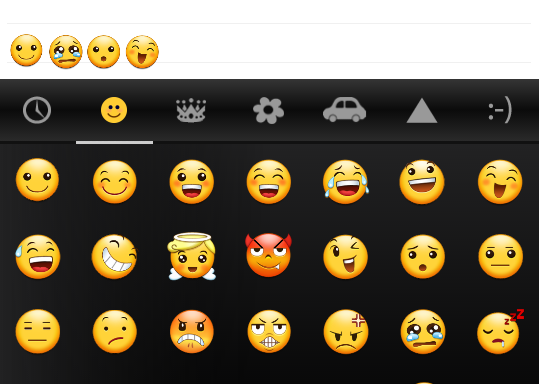 What are healthy ways you’ve found to express your emotions? In a few weeks, I will be moving out of my parents’ house. The cleaning process has begun, of digging through years’ worth of pictures, ticket stubs, notes, knickknacks…and memories. I’m sorting things into piles, recognizing that not everything will be able to come along to my new, smaller bedroom, and that not everything needs to. Allison Vesterfelt is one of my favorite bloggers. She has the tagline “Learning To Live with Less” on the main page of her blog, and it’s a topic she writes about often. It is both a physical and a metaphorical process, of learning to live with less stuff, but also with less emotional baggage. As I’m cleaning my room, I’m rediscovering that part of my problem is letting the two–the physical and emotional–get so intertwined. This is not unexpected, as I have long known about my pack rat tendencies. But as I prepare to move to a smaller space and attempt to embrace the idea of living with less things, it is not easy to suddenly untangle the two. These items seem inconsequential. 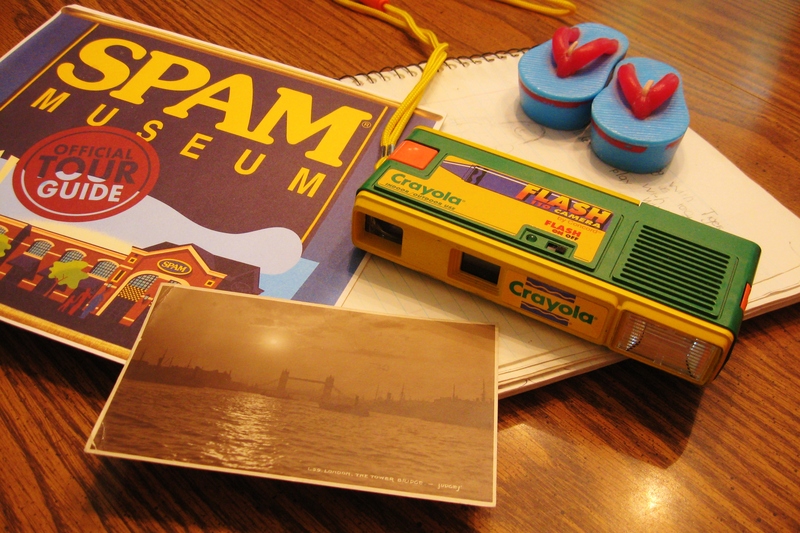 A pair of flip-flop shaped candles, a Spam Museum tour guide, a faded postcard of London, and a children’s camera, all sitting on a spiral bound notebook. If someone were helping me clean my room, they’d probably throw away each of them without a second thought. So let me tell you their stories. The flip-flop shaped candles were a gift from my sister from a trip she took, and they’ve sat on my dresser for years. They are dusty and old, but, even though I see my sister usually at least once a week, they still remind me of her. I visited the Spam Museum on the way home from my second mission trip and picked up this tour guide while there. While the visit to the museum is a fond memory, the memories of the mission trip are not entirely so–but I learned much about unmet expectations, change, and seeing God in spite of things not going the way I thought they should. One of my friends has lived in Scotland for several years, and she picked up this postcard of London for me from a thrift store or marketplace. Not only is it a reminder of my friend, it now brings back memories of my own trip to London last May and all that I experienced and learned from it. The message on the back from the original sender fascinates me, a tiny glimpse into the long-ago life of people an ocean away. The spiral bound notebook is one of those big ones with five sections. It had a purple cover, which fell off from overuse years ago. While it is nowhere near all the way full, it is a fascinating look at my childhood. Flipping through it now, I can see the way it began to shape my love of words, with dozens of one-page stories, drawings of characters with short biographies, and random thoughts from the day or week. Some of these items I’ve decided to keep, and some I’m getting rid of. My fear in getting rid of them though, and other things like them, is that once the physical reminder of the memories is gone, maybe the memories will be too. I know it doesn’t work quite like that, but I wonder if there are parts of my life I will never remember to remember without a physical representation. And if so, how bad is that really? What if I forget what it felt like when I got that notebook, the anticipation of being able to fill up all those pages with whatever I wanted? What if I forget the way that people have showed they care for me with little gifts that meant so much more? What if I forget what it was like to learn important life lessons for the first time? What if instead of throwing away an object, it’s like throwing away little pieces that have made me who I am? So then there’s the Crayola camera. Though I have few specific memories attached to it, there’s still film in it. I don’t know when I stopped using the camera, or if the pictures would even turn out if I tried to get it developed. More than that though, I don’t know if it would be wise for me to do so. It seems a shame to let those photos go to waste, but do I really need a few more? Would it simply be more clutter to store in boxes? I don’t know. While I know it’s not intrinsically bad to have things or attach some level of sentimental value to them, I’m figuring out what the line of “too much” is. Too much stuff, too much emotional attachment, too much worry that I’m throwing away memories and little bits of me instead of a notebook or postcard or tour guide. I don’t know where that line is, and I don’t know that I’ll find it even by the time the last box is packed. But at least I’m looking for it. p.s. Should I get the film in my camera developed, or just let it go?